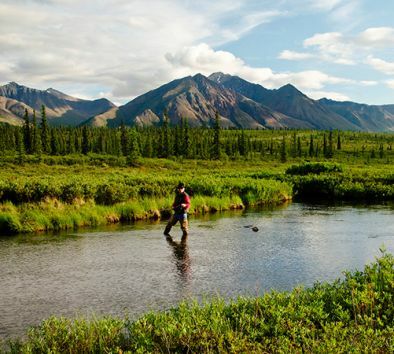 Soak up the beauty of Denali during this extraordinary half day fly-fishing expedition to Fish Creek. Gear up with lightweight fly-fishing gear provided by your guide—a dedicated fly-fisherman whose passion for the sport is contagious. Learn the basics of fly casting, roll casting, matching the hatch, landing fish and catch-and-release techniques. When you’re ready, cast your nearly weightless artificial lure for the Arctic grayling—a species of freshwater fish in the trout family. These ravenous surface feeders are thrilling to catch on the fly whether it’s your first time or you’re a seasoned angler. Wading and moving along the uneven riverbed may be necessary. While fishing, relax, breathe in the clean mountain air and take in the unbridled beauty of the Alaskan wilderness. Enjoy this unique opportunity to feel at peace with nature! Minimum age is 12. Fishing licenses are required for anyone 16 years of age or older. Licenses are available for purchase through your tour guide. This is a catch-and-release excursion. Guests should be in good physical condition and be able to walk or stand for approximately 3 hours. Travel over slippery rocks and mud over uneven terrain is to be expected. Bring a rain jacket, extra pair of socks, extra layer of clothing, sunglasses, warm hat, bottled water and camera. Fishing portion is approximately 3 hours. Please bring cash for your one day Alaska fishing license. Tour operates subject to meeting a minimum number of participants.